Back in May, I told you all about the EASTERN HELLBENDER, the kickass, potential new mascot Pennsylvania needs. 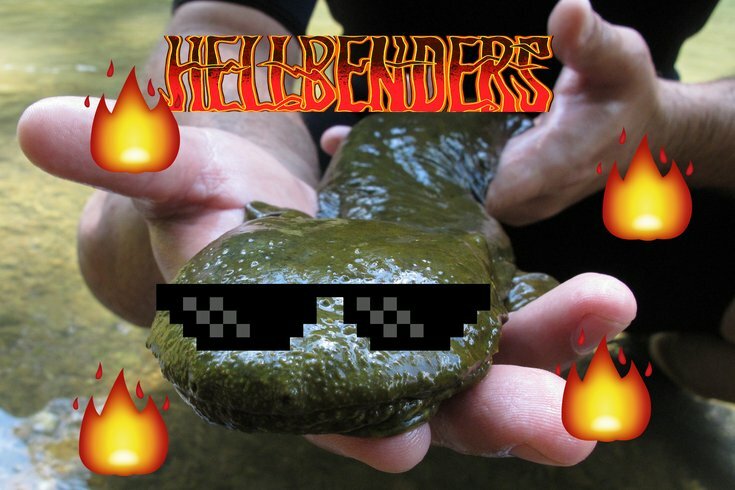 Well, looks like the Pennsylvania General Assembly is ready to RAISE SOME HELL make that possibility a reality, because on Thursday the Senate passed legislation to make the hellbender the Commonwealth's official amphibian. The legislation still needs to go through the House and get a signature from Gov. Tom Wolf. The bill from Sen. Gene Yaw, R-Williamsport, passed the Senate with a vote of 47-2. What's an eastern hellbender, you ask? Well, as we noted in the spring, it's a ROCK AND ROLL SUPER STAR THAT'LL LIGHT YOUR FIRE a "unique amphibian native to a select handful of areas," one of which is Pennsylvania, according to Yaw's bill. The Center for Biological Diversity says the "strictly aquatic salamanders are as interesting as their awesome name implies." They can grow up to two feet long, making them the largest North American amphibian. But Yaw didn't introduce his legislation just because hellbenders ARE BEASTS FROM THE SEVENTH CIRCLE OF ETERNAL DAMNATION are big and have cool names. The amphibians are in trouble. hellbenders work as a sort of natural testing kit for water, as they're incredibly sensitive to poor water quality and pollution, making them a so-called "indicator" species. Yaw, who crafted his bill with the help of a group of young conservationists, noted in his legislation that hellbenders historically have been found in every western Pennsylvania county, but now about half of those counties are no longer home to the amphibian. By making the hellbender Pennsylvania's official amphibian, the commonwealth is making a statement about its commitment to better water quality, Yaw wrote. There are plenty of other, more policy-oriented legislative efforts that would have pragmatic effects on the state's water quality, and those certainly should be pursued. But for now, let's all agree that the hellbender as an official Pennsylvania mascot is a necessity. Raise some hell, lawmakers.